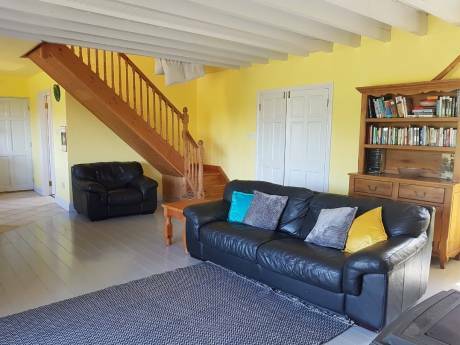 We have a lovely comfortable child-friendly home in a great location - a quiet cul de sac but only 30 minutes from Dublin City Centre. The house is very spacious, clean and modern (built 10 years ago). There are many things for children to play with and large gardens to play in. We also have some animals - cattle and hens! There are fresh free range eggs available every morning from the hens' laying box! We have five good sized bedrooms, one ensuite and another two bathrooms. 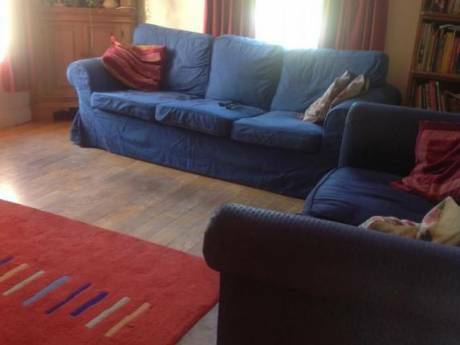 There is an open plan kitchen/dining/living room, another living room, a conservatory, a study and a games room (snooker & darts). There are two cars available for exchange also. We are a family of 6. My husband (Fintan) is a farmer and I (Sheila) am a primary school teacher. We have four children, 3 girls and 1 boy. They are: Sadhbh (10), Michael (8), Aoife (5) and Lára (2). They are well-behaved children are required to respect our home and therefore other homes also. The children enjoy sports, dancing, reading and playing outdoors. As a family we enjoy travelling and discovering new places/experiencing other cultures. We have never done a home exchange before and are looking forward to the new experience. 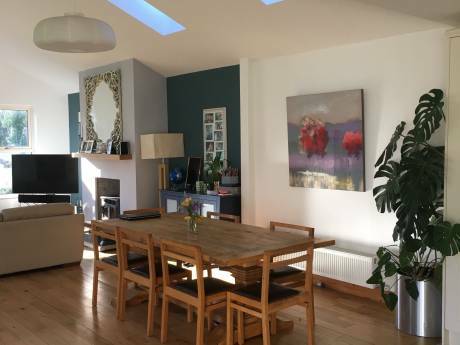 Our neighbourhood is 'the best of both worlds', on a quiet country lane but also only 30 minutes drive from Dublin city centre and 10 minutes from Blanchardstown shopping area which which has many shops, restaurants, bowling, swimming and cinemas. We are three miles from Ratoath village and also Dunshaughlin village. Both villages have good restaurants and pubs. we are also less than one mile from Fairyhouse racecourse. This would be an ideal exchange for lovers of horse racing over Easter, as it hosts the Irish Grand National on Easter Monday. (www.fairyhouseracecourse.ie) We are also 2 miles from a fishing lake/family park, which has many animals, playground, nature walks and other family activities (www.rathbegganlakes.com) County Meath has many historic attractions such as the neolithic tombs at Newgrange, Trim Castle, the Boyne river and the Hill of Tara.